Find a proper casino, make sure you deposit to get the welcome bonus, and you are ready to try Gin Joint Jackpot Slot. The Perfect combination for real gentlemen is the gin joint, and that’s the main symbol when you think of the American prohibition back in the 1920s and 1930s. The story that Random Logic is trying to tell through Gin Joint Jackpot Slot takes us to Chicago exactly in this period of time where the crime rate is enormous, there is racketeering and numerous of gangster movies have been released in this period in the states. Gin Joint is a slot with five reels and 20 paylines that you can pay with a denomination from £0.10 up to £200.00. You need to select one of the casinos on the right-hand side of this article to start playing the game, but we will speak about the casino a bit below. The game’s maximum payout is a coin multiplier of x10,000 and with two interesting bonus rounds and a Progressive Jackpot, you simply can’t ask for more from this slot. 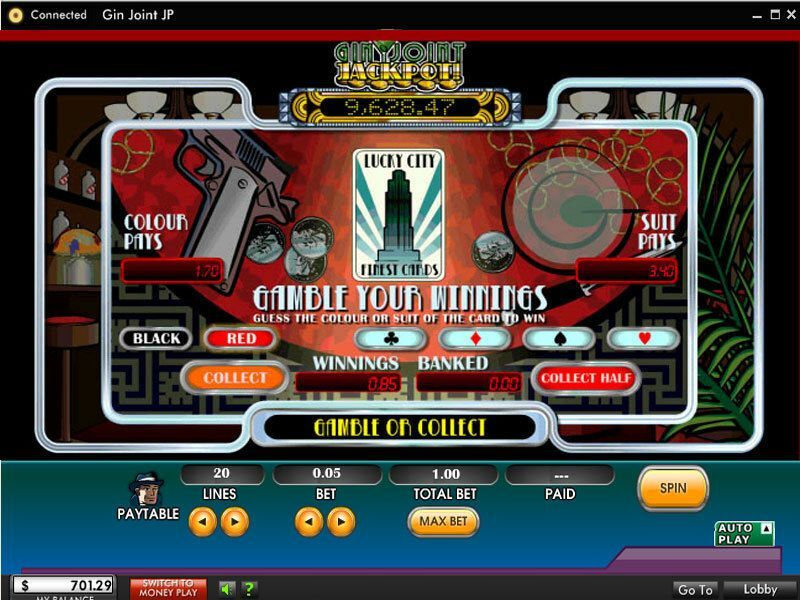 If you’ve had enough of us, you can start playing the game immediately, or you can keep on reading the review below to find out more about Gin Joint Jackpot Slot. The online slot game by Random Logic has a lovely screen and outstanding music typical for that period of time, so pop the volume up and enjoy the slot. The whole screen is dark, and the setting is in a local pub – some of the forbidden ones at that time. The reels are in the middle of the screen, and with the dark background, you can easily see the symbols and everything that the game offers. The top of the game is for the logo as well as for the progressive jackpot amount. The sides are for the paylines, and if you mouse over them, they will appear on the screen. On the bottom, however, are the adjustable features of the slot where you can adjust the lines, bet, total bet, spin. You can see the amount you’ve won, check the paytables and find the Auto Play and Bet Max right next to the spin button. All of the symbols in the slot are related to the theme so we have the black and white spectator shoe, the sharp hat, knuckle dusters, a Tommy gun and a green cocktail. There are also a number of characters including two femme fatales, the detective, the henchman, big boss and the police officer. The detective, big boss, henchman and police officer all have bonus feature involvement and the wild symbols is a classic 1920s car. The online slot game has five reels and 20 paylines and as we said, you can play it as soon as you select a casino where you will play the game. 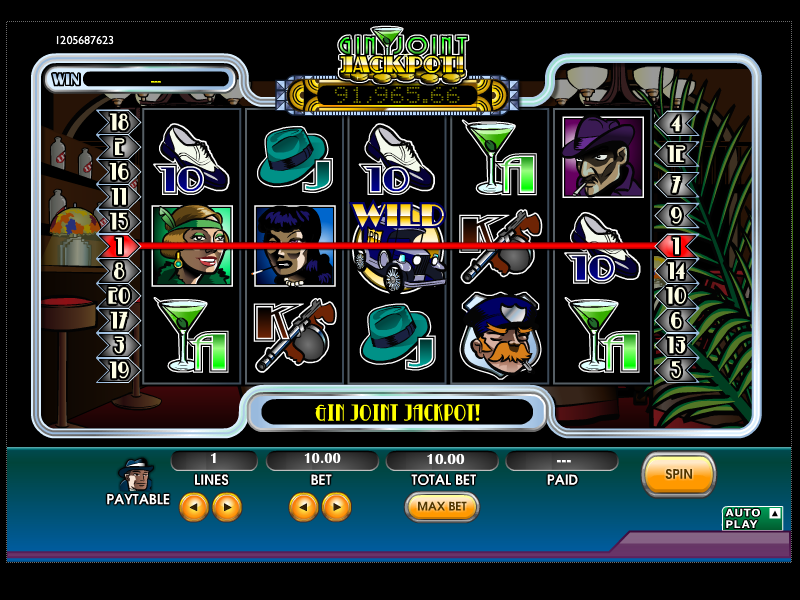 The casinos are located on the right-hand side of the screen and you can see their welcome bonuses. The casino is an important part of your gameplay as you will spend most of your time on the pages of the same, and they will give you their selection of games, customer support as well a unique welcome bonus. Once that’s done and you are inside Gin Joint Jackpot Slot, it’s time to set the denomination that you will play with. You can set it with a range from £0.01 up to £200.00 where the maximum amount that the game pays out is a coin multiplier of x10,000! This is one of the best multipliers that we’ve seen in a while, so it’s definitely worth playing this game. There are two fantastic bonus features in this slot, so without further to talk, let’s explain them. In Reel Shootout – If there are one or more henchmen, there is a great gun animation and the more henchman you manage to kill, the greater the prize. Shootout Bonus Round – This round is triggered if you have the detective on reel one and the big boss on reel five. You can control the gun yourself to kill the henchmen, or you can leave it to do its work automatically. Progressive Jackpot – The final battle is with the Big Boss in his truck, and for that to happen, you need to destroy the truck when it carries three barrels. The game is interesting, and you can learn a lot about what the States were passing through in that period of time.